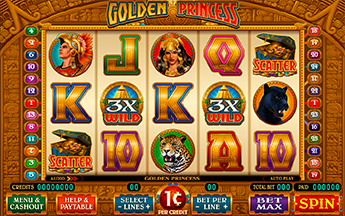 The Golden Princess leads players through the secret fortunes of an ancient civilization. Jaguar symbols along the trail indicate excitement ahead. Players who reach the Golden Temple or the Scatter Treasure Chests are richly rewarded for their adventure. 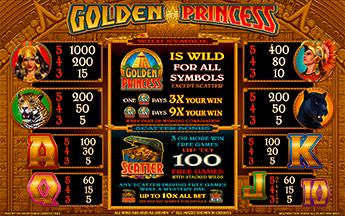 3 or more Scatter Symbols in any position awards up to 100 Free Spins. Free Spins can be retriggered. Mystery Pays are awarded in addition to any retriggered Free Spins. Earn up to 10x Mystery Pay per scatter symbol during Free Spins. Mystery Pays are multiplied by total bet and are in addition to any Free Spin retrigger award.